Welcome to the online home of Owl Custom Woodworks, owned and operated by Ken Loree. With over 30 years of industry experience Ken's knowledge, skill and creativity with wood has been a great benefit for all of his clients. Owl Custom Woodworks uses the finest grade lumber such as yellow and red cedar, eastern and western maple and laminate hardwood such as maple and birch to create a variety of custom kitchens, bathroom vanities and furniture. Ken's motto is "Furniture for life". 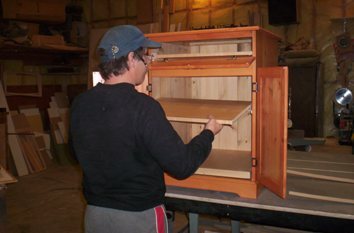 If you are interested in owning your own custom furniture made right here on Vancouver Island then contact Ken. He can make your ideas a reality. From custom kitchens to bathroom vanities or living room tables and anything else you can think of Owl Custom Woodworks has done them all. Please check out our photo gallery to see Ken's work from over the 10 - 15 years. If there is something you have in mind please feel free to contact Owl Custom Woodworks on the Contact Us page. What kinds of things does Owl Custom Woodworks make? Tables, benches, armoires, hutches, vanities, kitchen cabinets, signs, desks, dressers, computer desks, office furniture, chests, foot lockers, TV stands, entertainment centers, doors, windows, corner cupboards, wall units, credenzas, side boards, china cabinets, closet organizers, reception desks, display cases and more!